In all the pain and heartache, these people sustained me, and I have fond memories of all of them (except Jamie--he'd left by now--yes!). 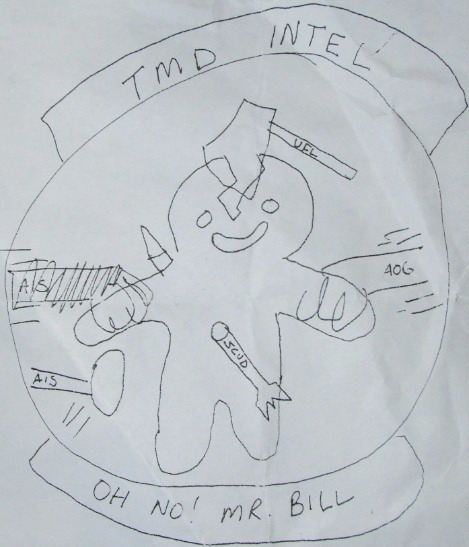 When the commander suggested we come up with a patch for TMD (Theater Missile Defense), we all got together (Matt included) and made this little patch. A little dark sarcasm seems to always come with us Intel. We were being pulled from every direction...the AIS (607 Air Intelligence Squadron) pulling on the right was our parent unit, the AOG (Air Operations Group) controlled the planes and had their own plans for us, UFL (Ulchi Focus Lens--the world's largest command-post exercise) we used to prove ourselves, and while all of our units and requirements were pulling from left to right, we were hit by a North Korean SCUD missile. I guess it's funnier if you don't know what it means. On November 6, my office had a little going-away luncheon for me at the nearby Bigoki House (not sure on the spelling) in Song Tan, Korea. The movers had just cleaned out my room that day, and as I sat alone in my only chair with a bag of my worldly goods, I wrote a heartfelt poem to Karen Gulledge (see More Than Words ), a ghost from my past whom I hadn't seen since June 25, 1988. I'd been writing pieces about all the other people in my life, and she was one who'd been left out. My boss Matt (below,right), who still didn't believe I had won that race at Yongsan and his boss Laura (middle photo), Stan, Aaron, Deena, and an assortment of folks from my office joined together to say goodbye to me on this night. My office was my family and they'd gone through all the trials with me as well as their own personal trials. We were such a tight group, and I must thank each of them for being there for me to lean on when I needed it, sometimes carry me, but always give me giggles. (I told Matt it would've looked more exciting if they'd shown the SCUD ready fully erected). On November 9th Stan, Aaron, Mark and I did our last Bible study together in the dormitories, I went to Deena's room and gave her a hug (she'd just stepped out of the shower and smelled goooood) and the next morning I was off to the United States. So many bitter sweet memories I left behind. 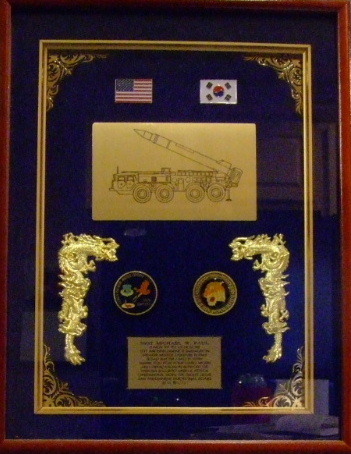 At their request, I wrote a personal parting poem about my office, and the time we shared and titled it,"One Hand Clapping" (See More Than Words ) to describe how I felt about my tour in Korea and later emailed it to them all. Like you feel when you feel one hand clapping"